The changing of the season can feel so obvious. I truly mean 'feel'. My head seems to hurt more. My emotions are a bit more raw. I'm sure it has a lot to do with my girls returning to school. My oldest is now in 6th grade and the 'tween years are all that they say they are, and more! (* deep breaths Ann * smile * deep breaths *). I've chosen to take on a volunteer position that is very new to me. This undertaking spends more time in my brain than I want it to. The sun is starting to fade and that makes me sad. I do have a happy place though. And thank goodness it's in my neighborhood. Orleans Candle Co.
Jonathan and Tanya Scott, owners of Orleans Candle Co. have blessed my life in so many ways, they have no idea. They arrived in my little part of the world due to the tragic events of Hurricane Katrina. (Please read their story here.) Jonathan and Tanya Scott's kind, welcoming spirit make their store one of the places I can go to help me get through, or get over, emotional days. Candles, oils, soaps... these things make me happy. I've been burning a lot of candles lately. I feel power in their light. So what's inspiring you lately? 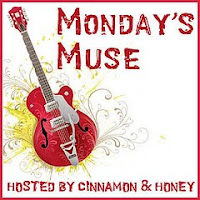 Please join Robin at Cinnamon and Honey and share in Monday's Muse.